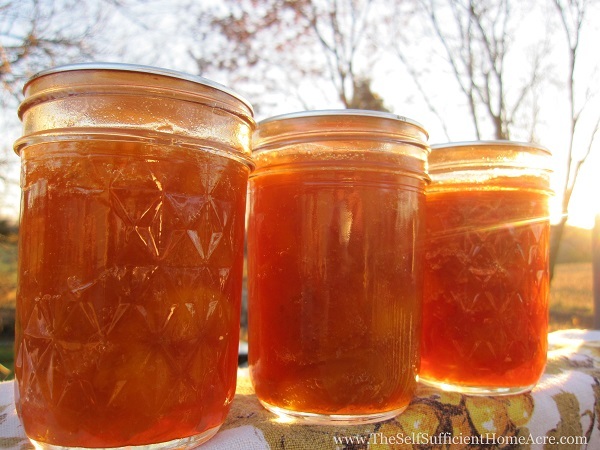 It’s Peach Canning Season on the Homestead! Between the bushel of peaches I brought back from Amish country in New York and a bag of peaches from my friend Audrey, I had some work cut out for me this week! It seems like a lot of work when I’m in the middle of a canning session, but it is well worth the effort in the winter when we have home canned fruits and vegetables. I love knowing that we have healthy food ready to eat even if we are snowed in and the electricity is out. Filling the jars with peaches. I canned 34 pints of diced peaches and 16 half pints of peach jam over the last few days. We also had a peach pie and fresh peaches eaten over the sink…they are so juicy! It seems like a lot of food when I look at the jars ready to go in my canning cupboard, but I know that we could go through them very quickly. I love peaches and planted a peach tree in our chicken pasture last year so we can raise our own. This year our little tree gave a total of 4 peaches, but I saw from Audrey’s trees that it doesn’t take too many years for the harvest to take over your kitchen! 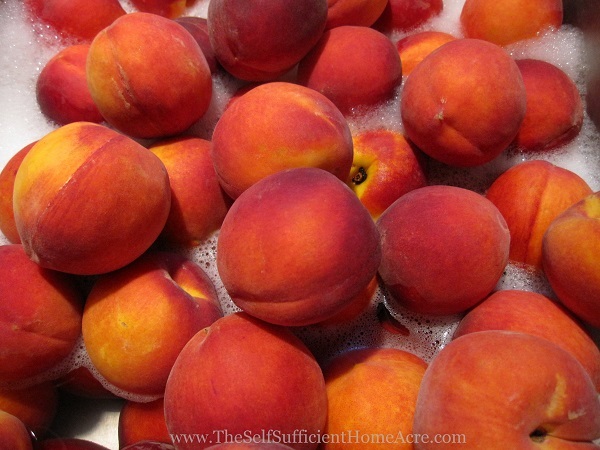 Washing peaches to prepare for canning. Peaches are an acid fruit and can be processed in a hot water bath canner. 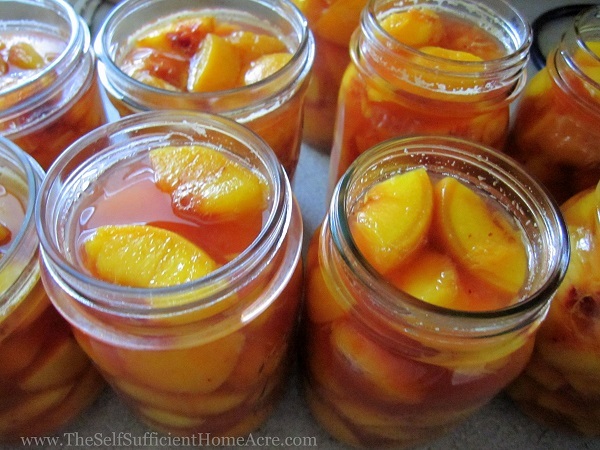 For safe instructions for canning peaches read this. Check out my post for information on planting fruit trees for self sufficiency. 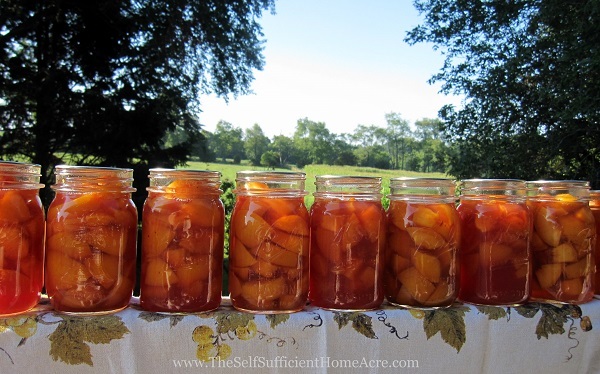 Are you canning peaches or peach jam this year? I absolutely love your blog it is a million miles way from my townie life – so I will follow you for some escapism! Lemons would be lovely! I’ve always thought it would be wonderful to live somewhere warm where I could pick mangoes, lemons, and oranges right from the tree 🙂 And lemon curd sounds amazing! Thanks for following me! They just look so delicious my mouth is watering. That looks so delicious! I love jams and this looks so pretty too, all lined up. I don’t think I could wait for winter for that. It’ll be all gone by then. 🙂 but that’s just me and my sweet tooth. Thank you, Mai! It is hard to wait to enjoy the ‘fruits of my labor’ but I have quite a bit of fresh fruit available right now 🙂 Thanks for visiting! Oh yum! I love peaches though it’s very seldom that we can buy them fresh here. Thanks for sharing your photos on OYGIF. Beautiful pictures of your sunny harvest! We used to have a peach tree on our farm but the fruit never seemed to ripen without expensive sprays – otherwise the fruit turned gnarly. 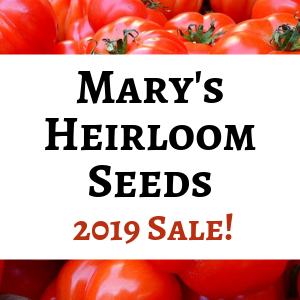 We didn’t know what kind they were & they were late fruiting.. We found for ourselves it was less costly to buy a bushel from our Amish neighbors who have a truckload shipped up from down south. Word travels and lots of people show up (in cars or buggies) to take peaches home. We just came home today from picking up our bushel – they are large and sweet yet some still firm so we’ll be eating peaches for a few days to come. Yum! I hope I have better luck with my peach tree! We had two that ripened and were delicious…so I hope that’s a good omen. You probably bought your peaches at the same place that we picked up our peaches while we were visiting my parents! I can’t remember what they sell at their shop there, but they have a regular work shop. Enjoy those peaches while they are fresh and delicious! How pretty all lined up like that. We got 2 good peaches off of our new trees and a couple more the bugs got. Oh I can’t wait to have our own. I finished 84 qts of peaches last week, picked from a local orchard. Beautiful pictures! Those look good! What liquid did you use… fruit juice/honey/sugar water? I ended up canning 56 quarts of peaches this year and am happy to be finished! Like you said… a lot of work and feels like a lot, but they’ll be nice midwinter! Trying to dehydrate some on Friday… we shall see.